The Academy of Model Aeronautics (AMA) and United Way of Delaware County recently awarded Mrs. Jennifer Freeman’s third-grade class at Wes-Del Elementary with the first Take Off & Read challenge prize. The winners of the Take Off and Read Challenge pose for a group photo. The Academy of Model Aeronautics (AMA) and United Way of Delaware County recently awarded Mrs. Jennifer Freeman’s third-grade class at Wes-Del Elementary with the first Take Off & Read challenge prize. As a class, the students read 170 books, out of nearly 600 books read in Delaware County by third-grade students as part of the first Take Off & Read Challenge. AMA partnered with United Way to design a program to encourage reading and aviation education. The program is one of the newest initiatives taken on by United Way to focus its resources on early childhood education in an effort to end the cycle of generational poverty. From January 29 to March 9, 2018, participating classrooms competed to read the most books. The students were asked to record their reading using a flight log, and complete a one-page book review form. AMA continued its mission to inspire education through aviation by providing each participating school with aviation-themed books for their library that could be read for the contest. 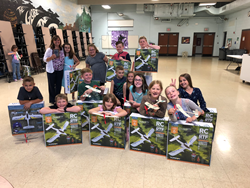 The students in Mrs. Freeman’s class were treated with a pizza party, plaque, and Remote Controlled airplanes for each student. The students also enjoyed a full model aviation experience with the AMA’s mobile model aviation experience trailer, flight demonstrations, and hands-on activities. AMA congratulates the winning class, and all the students who worked hard during the challenge. To learn more about Take Off & Read, visit: https://www.invitedtoliveunited.org/cglr/.